Global environmental challenges, such as climatic shifts, ocean acidification, and anthropogenic pressures urgently require detailed knowledge on functioning of the marine biota in order to create realistic models that predict future changes in populations, communities, and ecosystems. The long-term monitoring observations remain one of the best and sometimes the only way of acquiring knowledge on the complex seasonal and multiannual processes taking place in marine realms. This volume focuses on the long-term studies conducted for the past several decades in the White Sea, a relatively small marine basin located in sub-Arctic and Arctic zone in the northwest of Russia. It has a peculiar hydrologic structure: the upper water layers which experience strong seasonal temperature fluctuations and are inhabited by boreal organisms almost do not mix with the deeper waters which have negative temperatures the year round and are occupied by the Arctic species complex. The White Sea has a long-standing history of extensive environmental monitoring spanning all levels of the ecosystem. The goal of this special issue is to present the key findings of these studies to international research community and to identify environmental and biological processes that are involved in the ecosystem change of this important sub-Arctic marine basin. The long-term studies at the White Sea Biological Station of the Zoological Institute RAS are funded by the Russian Academy of Sciences through different programs including “Biological resources of seas in Russia” and “Biological diversity”. While editing the present special issue AS was partly supported by a fellowship of the Hanse Wissenschaftskolleg (Delmenhorst, Germany). The authors thank Dr. Inna Sokolova for valuable comments and corrections of the manuscript. Gerasimova, A. V. & N. V. Maximovich, 2013. Age-size structure of common bivalve mollusc populations in the White Sea: the causes of instability. Hydrobiologia. doi: 10.1007/s10750-012-1415-3. Granovitch, A. I. & A. N. Maximovich, 2013. Long-term population dynamics of Littorina obtusata: the spatial structure and impact of trematodes. 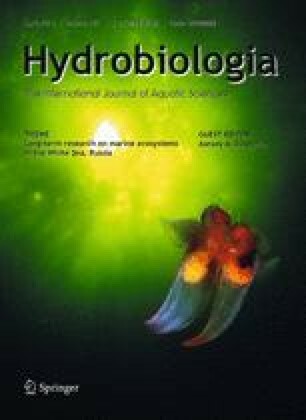 Hydrobiologia, doi: 10.1007/s10750-012-1411-7. Ivanov, M. V., D. S. Smagina, S. M. Chivilev & O. E. Kruglikov, 2013. Degradation and recovery of an Arctic benthic community under organic enrichment. Hydrobiologia. doi: 10.1007/s10750-012-1298-3. Khaitov, V., 2013. Life in an unstable house: community dynamics in changing mussel beds. Hydrobiologia. doi: 10.1007/s10750-012-1283-x. Khalaman, V. V., 2013. Regular and irregular events in fouling communities in the White Sea. Hydrobiologia. doi: 10.1007/s10750-012-1432-2. Kozminsky, E. V., 2013. Effects of environmental and biotic factors on the fluctuations of abundance of Littorina obtusata (Gastropoda: Littorinidae). Hydrobiologia. doi: 10.1007/s10750-012-1418-0. Levakin, I. A., K. E. Nikolaev & K. V. Galaktionov, 2013. Long-term variation in trematode (Trematoda, Digenea) component communities associated with intertidal gastropods is linked to abundance of final hosts. Hydrobiologia. doi: 10.1007/s10750-012-1267-x. Marfenin, N. N., F. Bolshakov & M. Mardashova, 2013. Fluctuations in settlement and survival of a barnacle Semibalanus balanoides at the White Sea intertidal. Hydrobiologia. doi: 10.1007/s10750-012-1377-5. Naumov, A. D., 2013. Long-term fluctuations of soft-bottom intertidal community structure affected by ice cover at two small sea bights in the Chupa Inlet (Kandalaksha Bay) of the White Sea. Hydrobiologia. doi: 10.1007/s10750-012-1339-y. Skazina, M., E. Sofronova & V. Khaitov, 2013. Paving the way for the new generations: Astarte borealis population dynamics in the White Sea. Hydrobiologia. doi: 10.1007/s10750-012-1271-1. Usov, N., I. Kutcheva, I. Primakov, & D. Martynova, 2013. Every species is good in its season: do the shifts in the annual temperature dynamics affect the phenology of the zooplankton species in the White Sea? Hydrobiologia. doi: 10.1007/s10750-012-1435-z. Varfolomeeva, M. & A. Naumov, 2013. Long-term temporal and spatial variation of macrobenthos in the intertidal soft-bottom flats of two small bights (Chupa Inlet, Kandalaksha Bay, White Sea). Hydrobiologia. doi: 10.1007/s10750-012-1341-4. Yakovis, E. L., A. V. Artemieva, M. V. Fokin, M. A. Varfolomeeva & N. N. Shunatova, 2013. Synchronous annual recruitment variation in barnacles and ascidians in the White Sea shallow subtidal 1999–2010. Hydrobiologia. doi: 10.1007/s10750-012-1340-5.